Al-Shabaka Executive Director Nadia Hijab joins Phyllis Bennis and Jewish Voice for Peace on Facebook for a critical discussion on Palestine in the current political climate. Gaza Approaching a Boiling Point? In the midst of pressing humanitarian concerns, what options do Palestinians and Israelis have to help prevent renewed violence? How can the United States and the international community bring the question of Gaza back into regional deliberations and the peace process? Israeli-imposed restrictions have limited electricity in Gaza to barely four hours a day, creating a humanitarian catastrophe for its 2 million residents. What Next for Palestine and the Palestinians? On June 6, 2017, Al-Shabaka Executive Director Nadia Hijab joined a panel of experts at the Arab Center Washington (ACW) to discuss the current situation and the future of Palestine and the Palestinians. 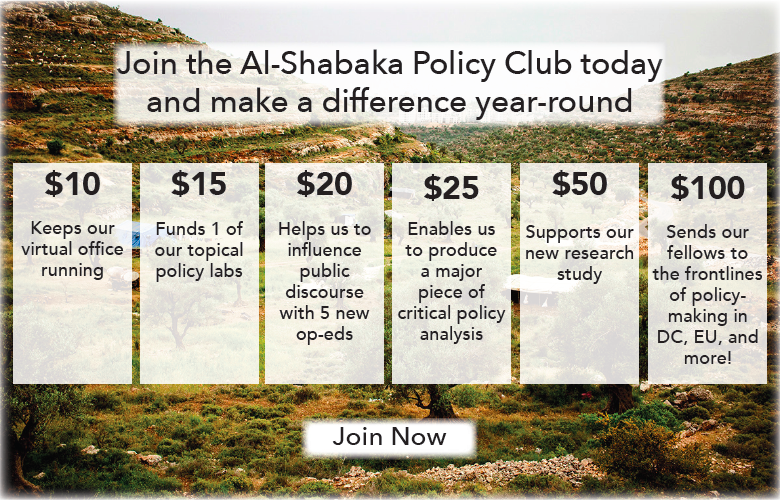 Al-Shabaka policy fellow Tareq Baconi talks with Under the Olive Tree about his latest policy brief, "How Israel Uses Gas to Enforce Palestinian Dependency and Promote Normalization." Al-Shabaka policy fellow Tareq Baconi joins Jewish Voice for Peace at their 2017 National Conference to discuss policing tactics, surveillance and the security state within the context of the Occupied Palestinian Territories. Al-Shabaka executive director Nadia Hijab joins Jewish Voice for Peace at their 2017 National Conference to discuss US foreign policy under President Trump and its impact on Palestine and the Middle East. Al-Shabaka analyst Samer Abdelnour joins a discussion on the question of boycotting Israel and the rise of the Boycotts, Divestments, and Sanctions (BDS) Movement.